The ochs und junior annual calendar is already a relatively light watch. 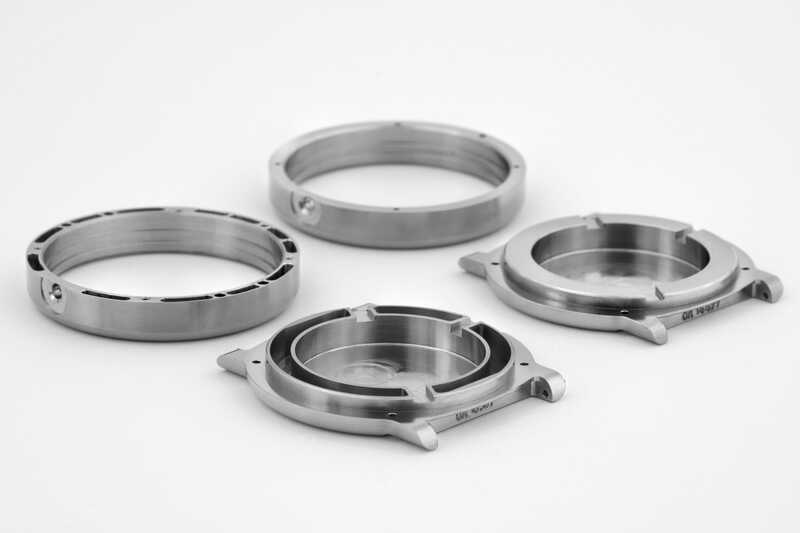 In grade 5 titanium, it weighs 61.99g (39mm) and 70.83g (42mm). With its analog date spiral, 6-part annual calendar function, and short lugs for a comfortable fit, Ludwig Oechslin designed it to be as functional as possible. In March 2016, HODINKEE named Oechslin’s annual calendar in its Perpetual Calendar Buyer’s Guide, writing “this annual calendar is so damn cool we had to include it”. annual calendar LIGHT is a new edition of Oechslin’s annual calendar that weighs less than the original and is equally robust, skin-friendly and water-resistant (100m). It weighs 39.97g in 39mm and 42.94g in 42mm. The 39mm edition of annual calendar LIGHT. We took a threefold approach to saving weight. The first step was radical milling of the 2-part case. Peter Cantieni manufactures annual calendar LIGHT’s case (as well as its buckle, dial, hands and calendar function) in Hinwil, Switzerland. He previously machined high-performance titanium parts for the Swiss Formula 1 team Sauber, and he also machines ochs und junior’s original annual calendar, moon phase, date and two time zones watches. Comparison of original 39mm case and LIGHT 39mm case (grade 5 titanium). 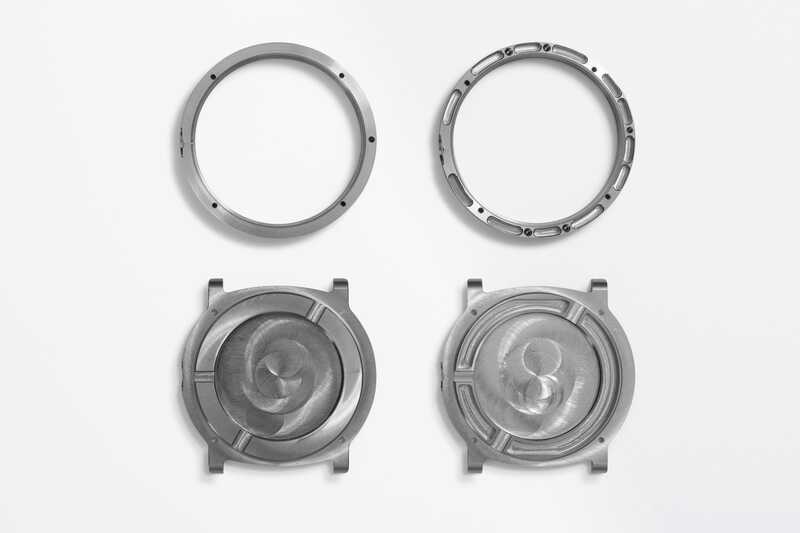 Both the original annual calendar and annual calendar LIGHT cases are milled out of single blocks of grade 5 titanium. For annual calendar LIGHT, Cantieni mills away every last gram of material from the case that does not affect the performance of the parts. It is a lot more work to manufacture the case this way. There is no external sign of Cantieni’s radical milling work. It is only for the owner to know (and sense) that the work has been performed. By every appearance, annual calendar LIGHT’s case is exactly the same as the original annual calendar. 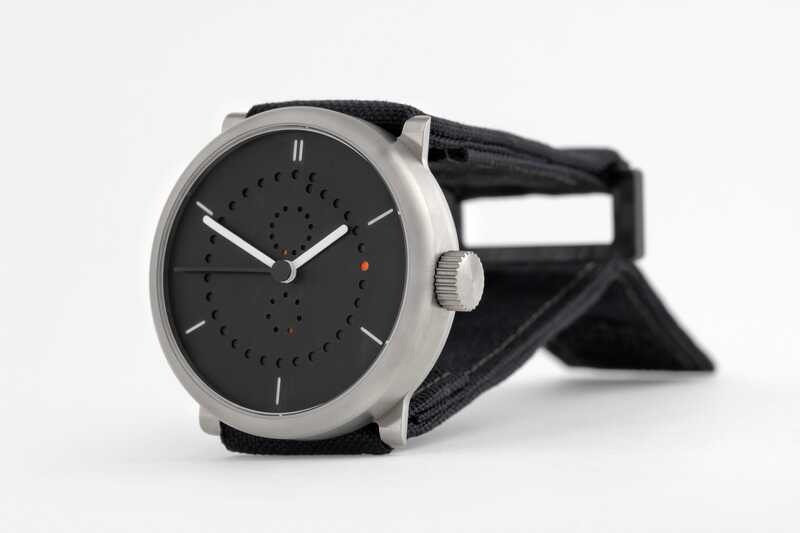 Designed by Oechslin and manufactured out of robust, hypoallergenic grade 5 titanium, it requires no movement ring and has just 2 parts for simpler achievement of water resistance. Comparison of LIGHT 39mm case and original 39mm case (grade 5 titanium). 39mm Al Mg Si 1 dial, date disk, month disk, weekday disk, and hands. The second technique for reducing weight was manufacturing the dial, gear wheels, hands, and crown in a far lighter material than brass. For annual calendar LIGHT, these parts are manufactured out of the aluminum alloy Al Mg Si 1. In addition to being extremely light (2.7g/cm3 vs 8.7g/cm3 for brass), Al Mg Si 1 is exceptionally machinable. This is critical because we are manufacturing functional parts out of it. 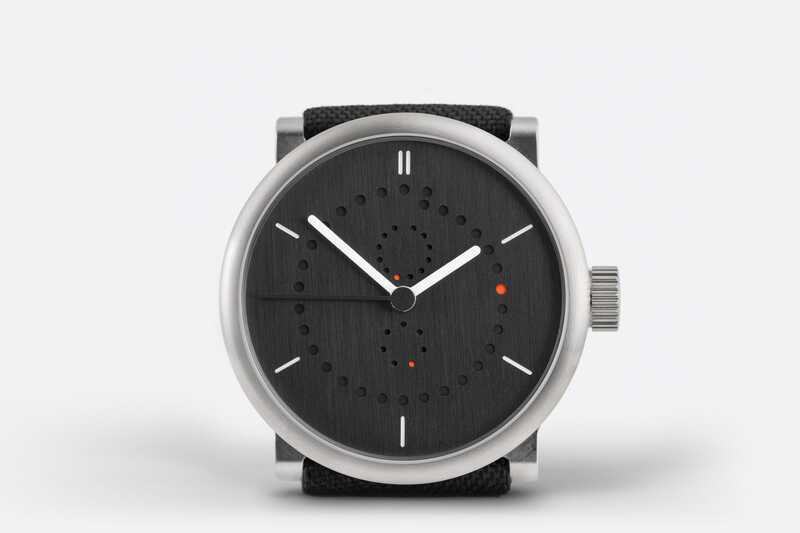 For Ludwig Oechslin, even the dial is an integral part of the gear systems he designs. His annual calendar dial also serves as a module which holds the gears for his annual calendar function on the rear side. You can see a picture and learn more about how it works on the annual calendar technology page. Further, Al Mg Si 1 is especially well-suited to anodization. This gives the possibility of creating contrast between dial components without even the “extra added weight” of paint. 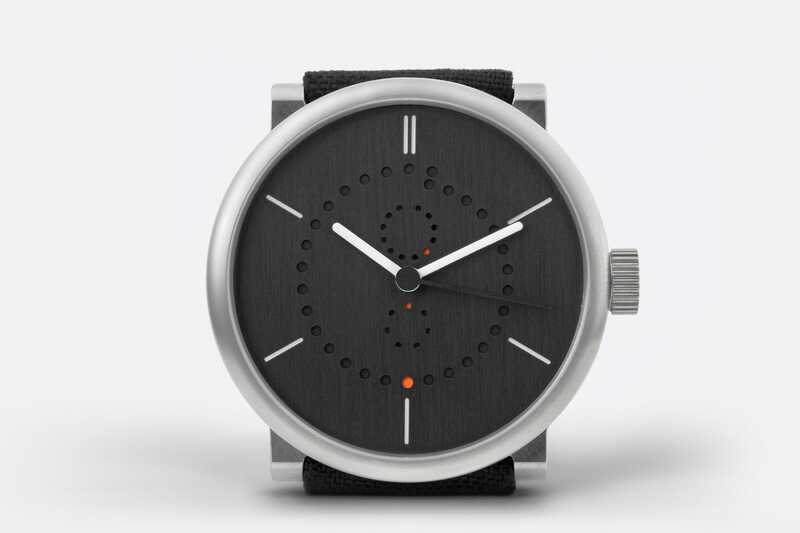 For the reference execution pictured on this page, the dial and date disk have been anodized black. New kevlar strap with carbon fiber buckle. 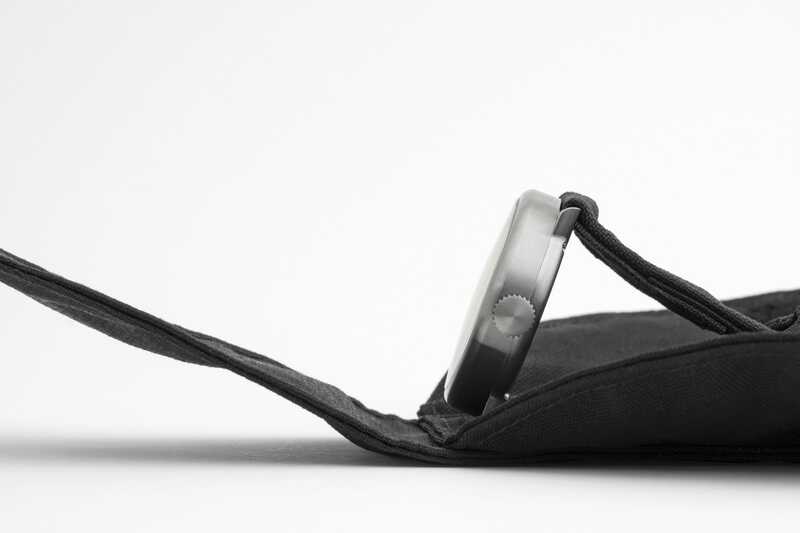 The third way we saved weight was by redesigning the strap and buckle. The new strap is tailor-made for each client by Sabina Brägger, the Bern textile designer who also designed and hand-makes ochs und junior’s sturgeon leather straps. The strap is made out of kevlar and fastened with Velcro. 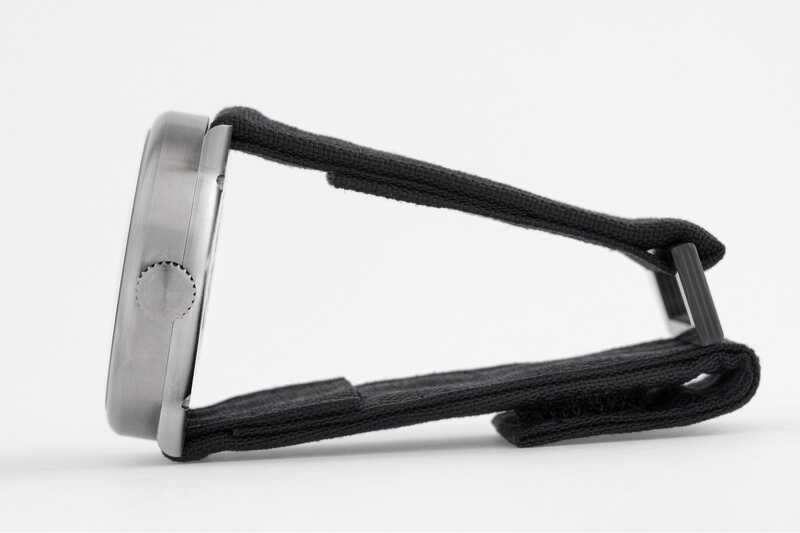 The buckle is also a new design and is manufactured by Peter Cantieni in carbon fiber. You can contrast annual calendar LIGHT’s strap with ochs und junior’s many other strap options. Together, radical milling, Al Mg Si 1 functional parts, and the new kevlar strap and carbon fiber buckle result in a total weight savings of 22.02g (39mm) and 27.89g (42mm) versus the original annual calendar. Why does Ludwig Oechslin’s annual calendar display the date as an analog dot, even though before you’ve used it for a few days, a digital display is quicker to read? The reason is that Oechslin’s analog date display solves an important problem with digital date displays. And since wrist watches are frequently used personal tools, an improvement can be worth the price of a small learning curve. If the date is displayed digitally beneath a small perforation in the dial, it will not be visible from as far away as analog watch hands. As a result, you might need to raise your wrist further to check the date than you do to check the time. This is why some watches add a magnifying glass over their date display, and others display the date as a very large number. Increasing the size of a digital date just creates a new problem, though. A more visible number becomes the first thing you notice when glancing at your watch, even though for most people, checking the time is a more common use case than checking the date. Oechslin’s solution is a gentle overlapping spiral of 30+1 date dots (learn how it works). After a few days on the wrist, reading the date becomes intuitive, like reading the time from watch hands. The date can be read from the same distance as the time, and the visual hierarchy of the time and date match how the watch is most commonly used. We see Oechslin’s analog date display as setting a new standard in legibility. 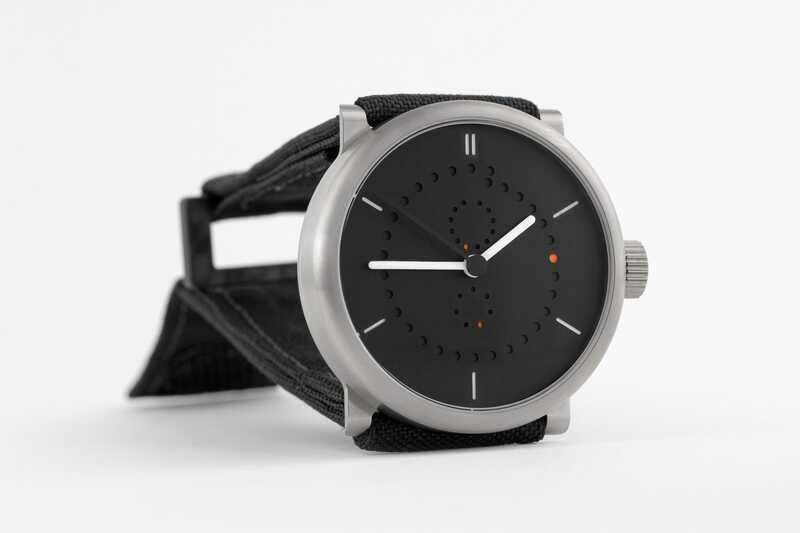 If we carry Oechslin’s focus on legibility all the way through to the color choices for the watch, what should the color choices be, for maximum legibility? The reference execution, pictured on this page, is our answer to this question. 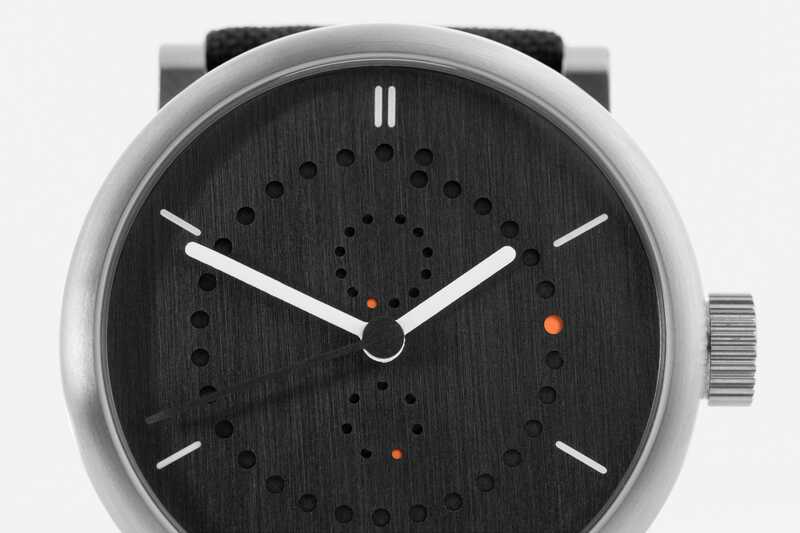 Black date, month and weekday disks with orange X1 Super-LumiNova date, month, and weekday dots. The primary function of a wrist watch is displaying the time. 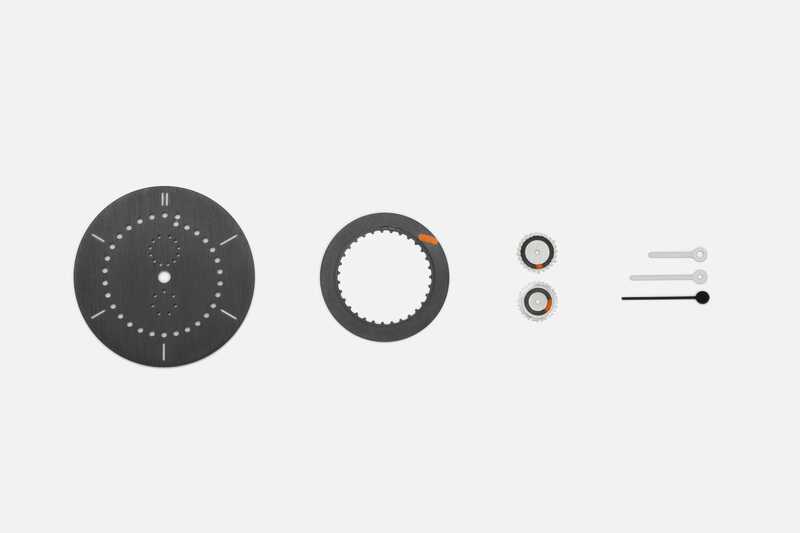 To make the time easy to read, there needs to be sufficient contrast between the dial and hands. If the time should be visible at night, there is just one possibility: a black dial with white hands, because the lighter the color, the better Super-LumiNova performs. The markers should match the hands, since they are most commonly used together as a unit. And the second hand should be in the dial color, so that the time is instantly visible when you glance at your watch, and the second hand is available when you need it and to show the watch is running. The date, month, and weekday dots should also have high-contrast with the dial, and be in a different color from the time, since they represent a separate information display. These have been executed in orange X1 Super-LumiNova. annual calendar LIGHT uses the latest version of Super-LumiNova, X1, which offers up to 2x the the brightness of standard Super-LumiNova after 12 hours. Rear-side of anodized 39mm LIGHT dial. We expect to manufacture about 10 annual calendar LIGHT watches this year. The dial, gears, case, crown, buckle, and hands are individually manufactured, which costs more. One-off manufacturing has advantages, though. It means our clients have the possibility of open-ended customization, and that our independence is preserved because we don’t have to take money from investors for capital-intensive bulk purchases of parts. ochs und junior is majority-owned by the families of cofounders Ludwig Oechslin and Beat Weinmann. In general, everything from screws, to crowns, to cases must be purchased in bulk in the Swiss watch industry. It is the tremendous amount of thinking which Ludwig Oechslin puts into designing more practical solutions that gives ochs und junior the opportunity to take a different path. For example, the 6 parts for Oechslin’s annual calendar can be manufactured by any small-scale, precision engineering shop. Former Formula 1 machinist Peter Cantieni individually manufactures the unique parts for ochs und junior watches Hinwil, Switzerland, about an hour from Lucerne. 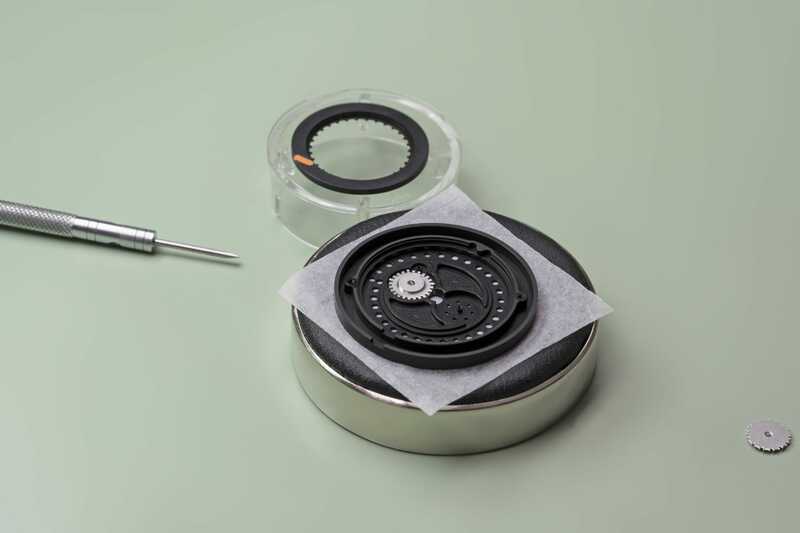 One-off manufacturing saves ochs und junior from the cycle of big investments, followed by a demand for high sales, followed by the requirement of heavy marketing, so common to the Swiss watch industry. Oechslin’s designs let us produce original, reliable mechanical timepieces with 4 employees and revenue of CHF 1.5M on sales of about 130 watches per year. We are pretty proud of annual calendar LIGHT – if you are looking for an annual calendar, we see it as the most functional available. The 42mm edition of annual calendar LIGHT. The reference execution of annual calendar LIGHT, pictured on this page, is designed for maximum legibility of the time and date. We have one 39mm and one 42mm reference execution ready to ship from Lucerne. The export price (excluding 7.7% Swiss VAT) is CHF 9’200. You can also customize your personal annual calendar LIGHT. For questions and to place your order, please contact cofounder Beat Weinmann. ochs und junior watches are exclusively sold directly from our workshop in Lucerne. annual calendar LIGHT comes in a handmade travel pouch.